Connect your GoFormz account to other business applications and enrich your systems with real-time field data. Implement a constant current of real-time data between GoFormz and your other business apps. Push and pull data between GoFormz and your other business systems. Inspecta connected Servicemax to GoFormz to centralize and capture higher quality data using Dynamic Field Properties. RunEnergy automated the transfer of captured data to Quickbase without retooling or retraining any of their team. Alpine gathers more precise and complete information using GoFormz conditional logic. Build real-time, bi-directional integrations and include both online and offline capabilities. 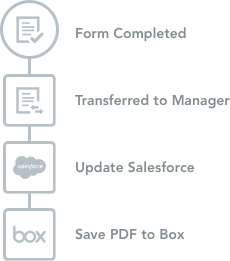 We have a powerful platform that enables faster, better and smarter digital transformation with mobile form data. GoFormz web and mobile apps platform provide the missing interface to collect data for any of your existing business systems from any location. We offer custom template building services to help you get the most from your mobile forms. Ok, let's see How it all works Created with Sketch.